As you can see in the photo my 80 boxes have been routed. After this photo was taken, the boxes were sanded using 180 grit sand paper in an inverted half sheet orbital sander. 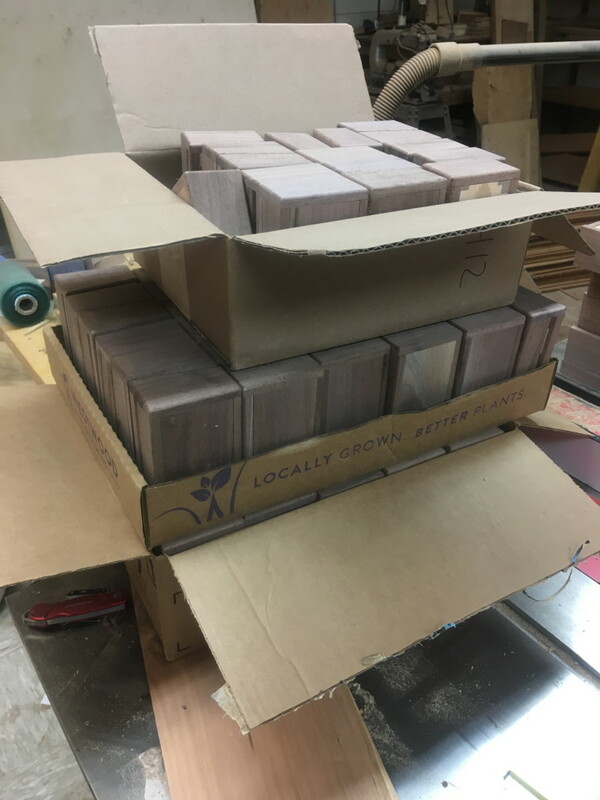 Two more sanding operations will be required for each box to prepare them for signing and finish. If all works well, I'll be ready to begin applying Danish oil by the end of the week. I am also preparing for a day long class at ESSA on Saturday, making boxes with veterans in a special event to honor their service. At ESSA we believe that art is vital to the human spirit, and the creation of art is part of a process of healing for veterans, their families, and our communities. We are made whole when we are engaged in creative processes, and in service to each other. Make, fix, and please create. Enable others to perform likewise.